Whether you are claiming business mileage from the IRS, billing clients for travel expenses, keeping tabs on your employees and business vehicles or a combination of all of these, the Little LogBook fits the bill perfectly. The strength of Little LogBook lies in its extreme simplicity. Plug the Little LogBook into the cigarette lighter of your vehicle using the USB power adapter supplied - you can also plug it into the USB port in your vehicle if it has one. Little LogBook plugs into your car cigarette lighter socket. Wait a few seconds for the device to acquire a satellite fix, then off you go - your trips are now being logged. The small GPS device, no larger than a flash drive, does all the hard work of collecting your trips as you drive. The dual USB charger allows you to use/charge your other devices while your Little LogBook is in use. 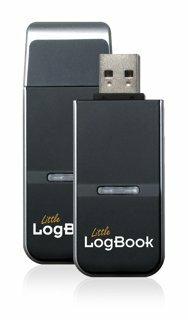 Simply unplug the Little LogBook from your vehicle then plug it into the USB port of your PC - no additional cables required! The user-friendly yet powerful software enables you to download and manage your trips at the click of a mouse. NO MONTHLY OR ANNUAL CONTRACTS. Little LogBook is an automated electronic GPS trip logbook solution that takes away the responsibility and inaccuracy of manually recording trip logs. Highly sensitive and accurate SIRF GPS chip provides world-class trip logging. Secure - Device is password secure so your movements cannot be studied should your device be lost or stolen. Free software updates - We'll keep your software up to date and cutting edge, for free. If you have any questions about this product by Little LogBook, contact us by completing and submitting the form below. If you are looking for a specif part number, please include it with your message.